If you’ve been attending college in a different city than your hometown and you’re ready to move out of the dorms, chances are that it’s the first time you’ve been truly on your own. In the dorms, you paid room and board, but that’s a lot different than paying monthly rent, utilities, and other bills. If you’ve been living at home and attending college, you’re in a similar boat. When you decide to move out, you take on a lot more responsibility and it’s important to prepare for it. From saving money and setting a budget, finding an appropriate place to live, and finding roommates to packing, storing, moving, and settling in, you have a monumental task in front of you. The best thing you can do is prepare ahead of time, and with the help of Just Store It!, you can store anything you don’t want to keep with you. For information about our storage units in Fort Collins, contact us from our location page. Most rental places require a deposit and first and last month’s rent. You may be able to find a place that only asks for a deposit and first month’s rent, but that’s still going to cost you. Generally, a deposit is about the same amount of money as one month’s rent. You’ll need to start saving as much as possible in order to cover these expenses. Set up a budget to help you figure out how much you spend on bills, gas, and food every month. How much disposable income do you have left? This is a great way to see how much you really spend on specific things, too. A few dollars here and there for a latte doesn’t seem like much, but when you add it up and realize you spend more than $50 every month on it helps you figure out where you can cut back in order to put more money towards rent and utilities. This will also help you figure out if your current job is paying you enough to live on your own. If not, it may be time to find a second or better-paying job. Having a steady income is key to covering the steady amount of bills you’ll have. Now that you’ve set up a budget, you can see how much you’re able to spend every month on rent and utilities. Know the max you can spend and try to find something less than that, if possible, so you can have a little bit of disposable income to enjoy your newfound freedom. There are a few different apps and websites that list apartments and rentals available. There are also social media platforms, like Facebook Marketplace, where people can advertise rooms available for rent. How long is the commute to class and work? Are the neighbors loud/do they party? Are the potential roommates loud/do they party? How cleanly and organized are the roommates? It’s important to find a place that’s convenient and you feel comfortable living in. Issues with roommates will arise, but the important thing is whether or not you can work through you differences and reach a compromise. 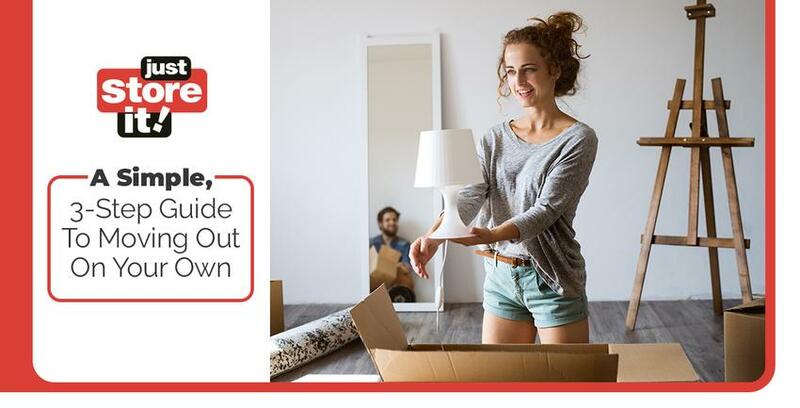 Now that you’ve found a place, it’s time to start packing your belongings. This is a great opportunity to assess your valuables and decide what you want to take with you and what you want to sell, donate, or store. When packing, try to organize items by room. Wrap fragile items in blankets or towels, or you can find newspaper, bubble wrap, or packing peanuts insteads. Heavy items, like books, should be packed in smaller boxes so they’re easier to carry. Be sure to label boxes with helpful information like the room they go to, whether they’re heavy or fragile, and even some of the contents. When deciding what to sell or donate, decide if you have time and enough items to host a garage sale. If you only have a few items, consider posting them for sale online. If you don’t want the hassle or have time to sell your old belongings, consider donating them instead. During the packing process, you may discover that you have items that you want to keep, but may not necessarily have room for at your new place. This is especially true with roommate situations where shared space limits what you can bring. It’s a good idea to pack up these items, but instead of bringing them with you to your new place and creating clutter, rent a storage space instead. At Just Store It!, we have a variety of storage sizes to fit your needs. Get more information about sizes and pricing, and contact us if you’d like to reserve a space. Congratulations, you’re ready to move! Keep track of your budget every month to help you stay on top of bills, continue to save money in case you have additional expenses, and keep an eye out for different living situations if you discover that the one you found isn’t all it’s cracked out to be. And for all your storage needs, trust Just Store It! to keep your belongings safe and secure.